Quickshot’s goal is to streamline the process of taking a series of screenshots with specific setups and in varying languages for documentation purposes. 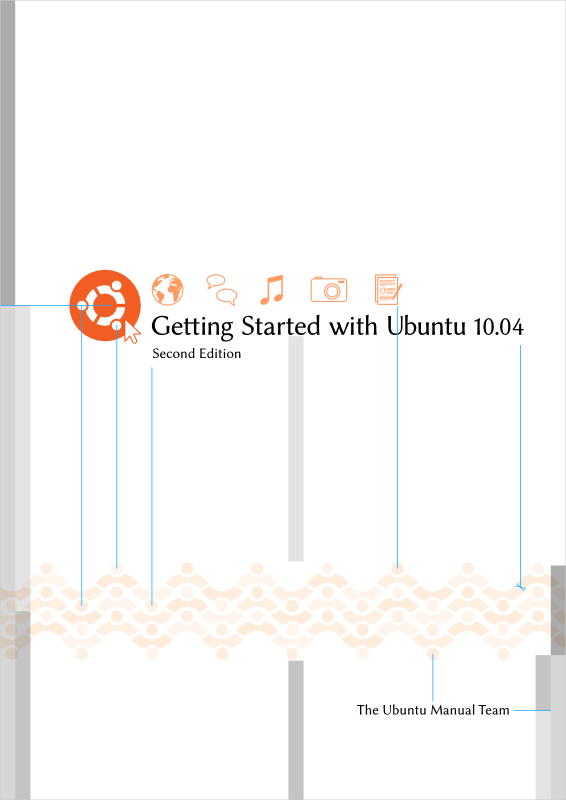 It’s a spin-off of the Ubuntu Manual project and currently being rewritten to better meat the needs of other projects. While an icon could make for an acceptable symbol for a logo, I felt this isn’t the case here. The contrast and coloring of the dark version is inspired by a camera flash. The bright version is for in-application use, where the other would feel too heavy. With the last set of design options I presented here, there were several people in favor of the 2nd version, a design with dots. 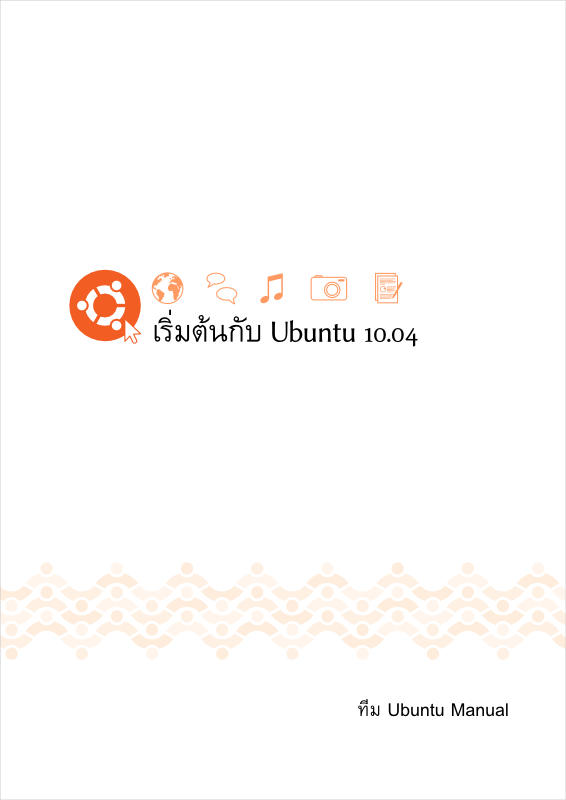 But what was not entirely clear to us after reading Mark’s explanation of the new visual identity of Ubuntu, has been explained by him via IRC: the dot patterns are meant to denote an orientation towards technical people. So we went with the Wave-of-Friends design, but not without a few further tweaks. All the graphical parts came to be in Inkscape anyway, and it allows to scale text fluidly. Otherwise Scribus could have been an option. A negative outcome is that the text on the title page has to be converted to vectors, as Inkscape can’t embed fonts, currently. Should hardly be an issue regarding file size, but this means no selectable text. I created 3 templates in English, for DIN A4, Letter and A4 with right-to-left text. The joy-to-work-with Kevin Godby wrote a script to generate SVGs for all the translations via string-replacement. Due to the carefully balanced layout and the wildly varying length of the text in various languages, each version has to be tweaked manually, still. 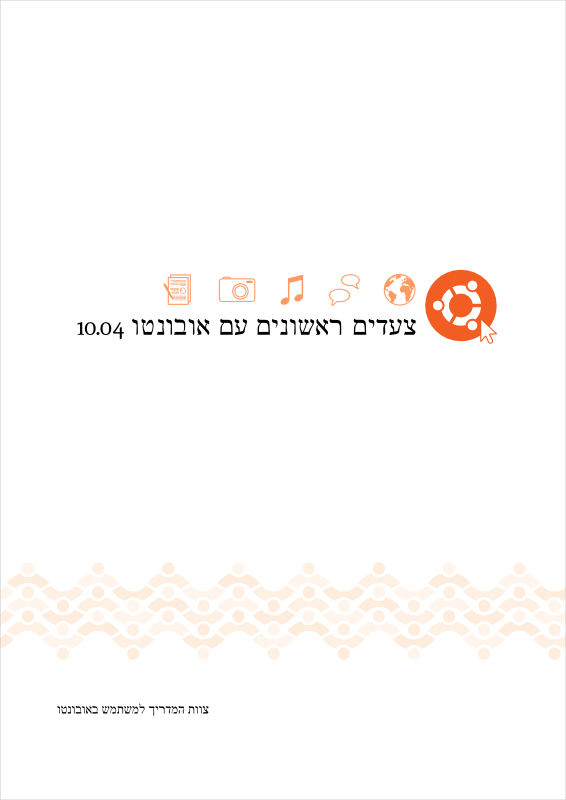 You can have a look at the progress of translation on Launchpad. Click View all languages on the right side. The space between inner and outer frame is the bleed area, used to avoid white edges if there’s a shift due to tolerances in printing. The frames and dotted lines marking the spine area are of course not present on the real thing. Getting Started with Ubuntu 10.04 will be released on time for the release. A second edition with bug-fixes and additions is planned for July. 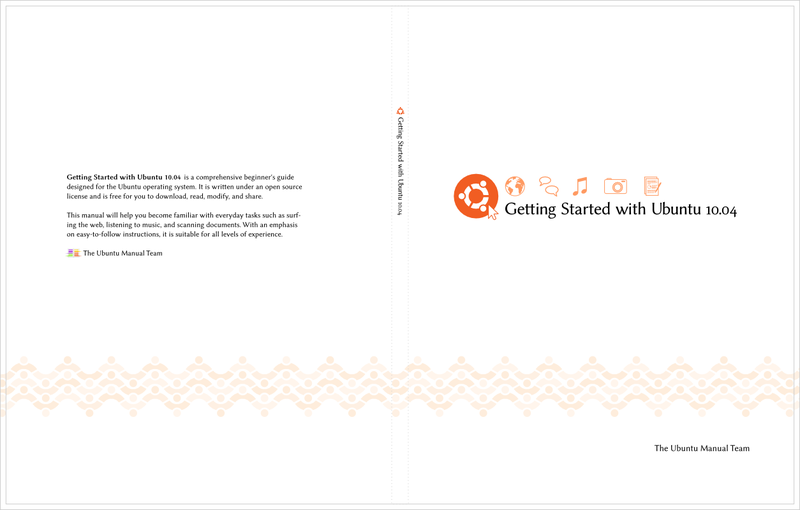 For 10.10, there will be an additional Quickstart booklet and a version optimized for inclusion on the Ubuntu CD. Quickshot, the tool used to capture lost of localized screenshots, will be improved and made useful for other projects. Read more on Benjamin Humphrey’s blog. 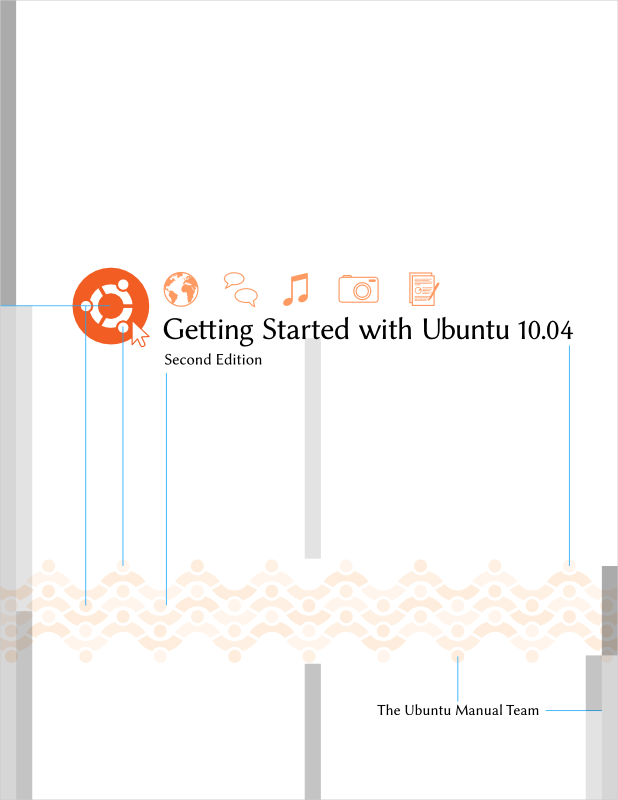 The Ubuntu Manual Needs You! The text of the English version of Getting Started with Ubuntu 10.04 is frozen since yesterday. There is planned to be a release candidate in about 3 weeks. So now is the time for translations and taking screenshots and that’s where the project needs your help! This will be a great resource for Ubuntu and you have the chance to work with a large team of great people using some very interesting infrastructure. Please read about the details and how you can get involved at Benjamin Humphrey’s blog. Nr. 1 was the clear favorite from the previous set, but there was some criticism of it looking too sharp, unfriendly. So I went back to the drawing board and presented a number of alternatives at the end of Saturday’s Ubuntu Manual meeting. The decision was pretty clear and after a bit of tweaking and adjusting it to different sizes, we have a new logo. Feedback on the previous round mainly happened via email. I concentrated on those who where so nice and thoughtful to describe how they perceive things. That’s so much more valuable than just votes for single options. Getting Started with Ubuntu 10.04 needs icons to mark Warning and Advanced notes in the document. First row Warning, based on the icon in the Humanity set, rest Advanced. dangerous bend approach inspired by Knuth (thanks Kevin Godby).